Marinate it with ginger- garlic paste, green chilli, lemon juice, garam masala, turmeric powder, chilli powder, cumin powder, egg, cornflour and salt and keep aside for 1 hour. Heat oil in a pan and fry the marinated chicken ..Serve hot.. 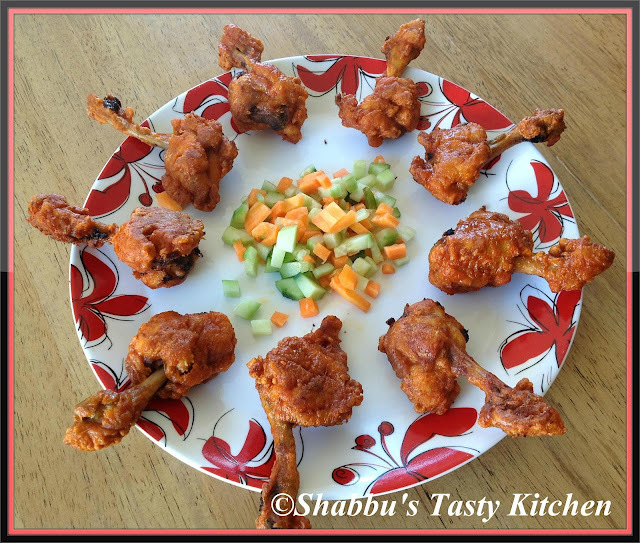 This is my favourite snack..I always order this in the restaurants..
My all time fav..Plz pass on the plate to me..
one of my fav starter..
Chicken lollipops Looks perfect !!!! They look professional and the glaze they offer,My God,I am fallen for this Shabbu.. These lollipops look very delicious. Wow chicken lollipop looks awesome..
Looks so appetizing...i am drooling. I love chicken lollipop, i will try your Ramadan Recipes entry for halal foodie.